If you have noticed a lack of paddling trip news, I apologize. The Forces That Be have conspired to keep me off of the water for most of the last few weeks. My day job and our river lot purchase has kept me quite busy lately, forcing me to miss out on paddling in some wonderful weather. I hope you have faired better. I did get to sneak out with my Dad recently to paddle up a secret creek in search of the ever elusive Oklahoma morel mushrooms. It was Dad's first time paddling a kayak, but he is a very skilled canoe paddler so he was fairly comfortable paddling Dianne's Heritage Angler fishing kayak. It was great to get a chance to share an hour or so paddling with Dad. He has a bad back, so I wouldn't want to subject him to a long paddling trip. 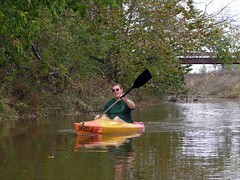 Paddling the local creek was just perfect. When I was young, Dad tried to teach me about many kinds of Oklahoma hunting. Morel hunting is my favorite. I only wish it were a longer season. Despite it being early in the season, we enjoyed 70+ degree temps, sunshine and just enough cloud cover for good picture taking. Check my Flickr pages to see more pictures from this trip, I have a special Flickr set for Morel mushroom shots from this trip. Stop by and see the Oklahoma outdoors pictures Dianne and I take and leave us a comment sometime. We would love to hear from you! I live in Tulsa and am interested in mushroom hunting. Is there a mushroom hunting club/group in the Tulsa area my family could join to search for mushrooms in out state? It sounds like something worth attending, if you find one. I don't know of any mushroom hunting groups. In fact, during the spring most mushroom hunters around here are more worried about stealth than grouping up. 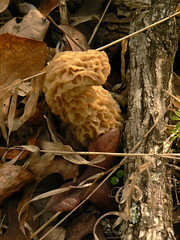 I know that morels are more plentiful in states like Tennesee and Oregon. They may have such groups there.